Welcome to video five in the Lead Guitar Quick-Start Series. In this lesson, we’re going to switch it up from major scales and learn the minor pentatonic scale next. 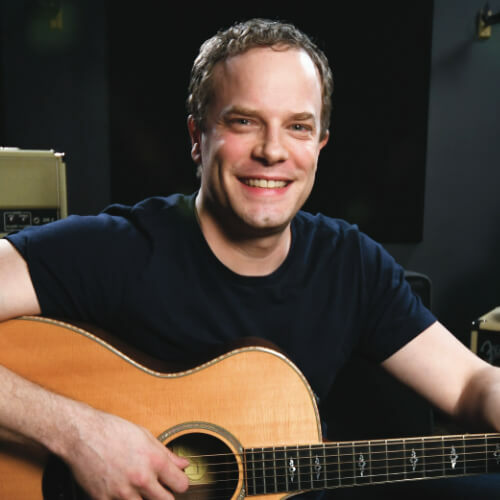 It’s arguably the most popular guitar scale, and no matter what type of music you play, this will add valuable skills for you as a lead guitarist. I’ve also got a new jam track for you to practice your minor pentatonic scale with, plus we’ll take a look at another muting technique using your picking hand. As we go through this lesson, always remember the previous tips I’ve taught you for both your fretting and your picking hand. As I play the minor pentatonic scale in the video, you’ll notice it sounds quite a bit different from the major scales you’ve already learned. To start this scale shape, notice the designated finger concept shifts down one fret, so your first finger has its notes on the third fret, third finger has the notes on the fifth fret, and your fourth finger grabs the notes on the sixth fret. On the low E string, start with the root G note by placing your first finger on the third fret, and then place your fourth finger on the sixth fret. Take some time here to get comfortable being on different frets, and moving from your index finger to your pinky. Moving on to the A string now, put your first finger on the third fret, and then third finger on the fifth fret. Next, the pentatonic scale shape gets really cool because the next two strings follow the same pattern. The D string will be your first finger on the third fret and third finger on the fifth fret, and then repeated again on the G string. Learning this scale is a little easier because the A, D and G strings all have the same pattern. To finish up this scale, we’re going to play the same pattern on the B and E strings that we played on the low E. On the B string, place your first finger on the third fret, and then fourth finger on the sixth fret. Repeat for the high E string, and you’ve got the minor pentatonic scale mastered. Just like the first two scales you learned, take some time to memorize this scale shape and where the root notes are. To keep the scale sounding clean, don’t forget to practice the muting technique with your fretting hand. Now I’ll teach you the other muting technique using your picking hand. Holding the pick between my thumb and index finger, I rest my other three fingers on the highest strings to make sure they don’t accidentally ring out. As I move up the scale, I move my fingers out-of-the-way as I need to play the higher strings. Once I’ve played the low E string, I need to keep it quiet too, so I use the palm of my hand to mute the lower string. The further up the scale I go, the more I use my palm to mute those lower strings and keep them from ringing out. Using your picking hand along with your fretting hand to mute the strings will help you make sure only the strings you mean to play will be ringing out. As a lead guitar player, keeping your sound clean and avoiding any extra noise will elevate your quality of music. Now you’re ready to try the minor pentatonic scale with the new jam track I have for you. This jam track is in the key of G minor, so it’s perfect to use while practicing this new scale. Practice enough so you’ve memorized the scale shape and the root note locations, then you can experiment with your own solos. In the video, I’ve got an example of what it might sound like. 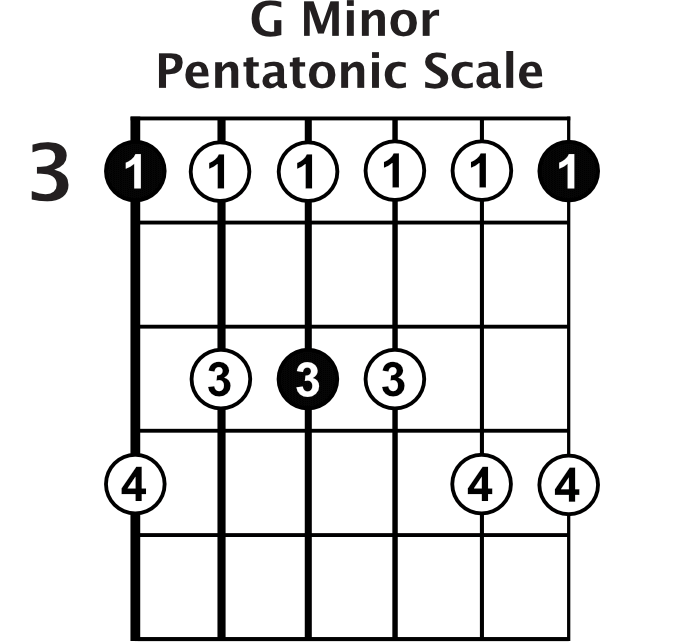 You’ve got three scales under your belt now: the major scale, major pentatonic scale, and the minor pentatonic scale. There are still lots of other scales to learn, but these three build the foundation of what you need to know to play lead guitar. In our upcoming lessons, we’re going to move away from learning scales and focus on techniques that will make these scales sound even better. We’ll look at techniques like bending, vibrato, and legato. Leave any comments or questions you have for me in the comments section below. See you in the next lesson!